Helps the body's natural defense system. 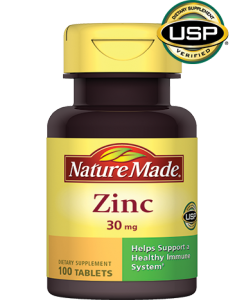 Zinc has immune-enhancing properties and is also vital for normal growth and development. * No artificial flavors, no preservatives. No chemical solvents, yeast, starch or gluten. Suggested Use: Take one tablet daily with a meal. Keep bottle tightly closed. Store in a cool, dry place out of reach of children.